He got involved with opioids in trying to cope. Since there is an opioid crisis in the country and I’ve seen many a normal person in our area ( Professionals / people across the board ) die from this I thought to just open up and share. He got in to Fentynol, a heroin subsitute, but he ( and many ) don’t shoot it…they *just* snort it. He went to rehab about a week ago and Scott ( middle son ) and I visited last night. So in rehab, for HIM, getting off of the opioid Fentynol was a three day nightmare and then over, because he’d not done it for very long, and was not shooting it. What is the REAL nightmare? Getting over his doctor prescribed meds for anxiety that he’d taken for six years. If you want to really understand the crisis in America today do some research in to what Xanax does to a person’s brain chemistry over time. Within a few days of detox from Xanax he was rushed to the hospital with extremely high blood pressure, one of his sides going entirely numb…and he can anticipate many episodes like that going forward. He tried going off of it before…when he was here with me. I had to rush to the pharmacy to get one of those teeth-things that kept you from biting your tongue because he was going in to seizures. At rehab they currently have him on anti-seizure meds right now. I WILL add this : while my son’s father and I reconciled and got along over time once our first mutual grandchild was born. when we had marriage troubles and I was beside myself, there was no drug to help me…I took long walks and prayed. By debralynnpugh | January 14, 2017 - 8:04 am | MISC. 2016 was a year of joining several sew-a-longs, participating in the Rainbow Scrap Challenge, and starting several projects on my own. Towards the end of 2016 I said that I did not want to work on anything new in 2017. I was having an inner debate at the beginning of January in regards to the RSC17. I did not want to start anything new, and I did not want to make anything new that was bright. 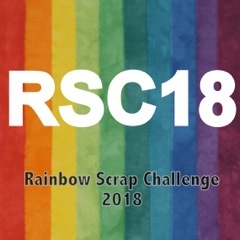 Last year I worked on these two RSC16 projects and one of them still requires a piano key border and the other I am undecided about thus far, so it didn’t make sense to me to start another new, rainbow-y, brightly colored project. This year I want to focus on finishing some things, and revisiting others. Yet, I’ve gotten used to joining in the Rainbow Scrap Challenge fun at Angelas’ and I didn’t want to miss out. I will follow the color of the month suggestion for further Little Baskets as well as for more appliqued Airship Propeller Blocks. I also included this applique border in the mix, because I have to start prepping for another one ( my Flower Basket Medallion project ) . When I cut out the little baskets ( starch, iron and freezer paper prep ) there are small scraps that are perfect for berries, and given that this Flower Basket project includes leaves of many colors I can prep a few purple leaves this month as well as the berries. I have worked on some prep this week and have a bit more to do before I settle down to beginning my applique.